Word on the street is that it's only risotto if you stir it non-stop for two hours. 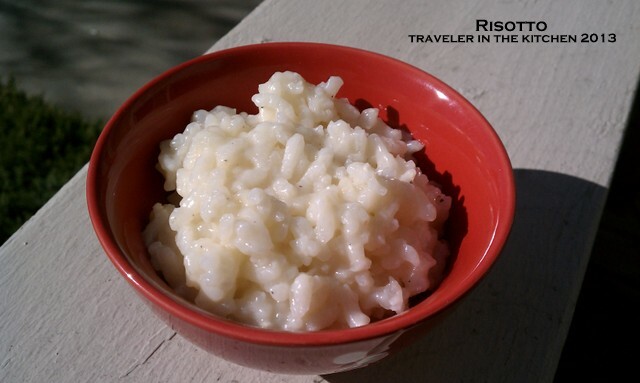 Risotto is so mysterious that the article on wikipedia needs additional citations for verification. Word of advice - go to a store that sells grains in bulk, like Whole Foods or Sprouts. Then you can buy just the amount of Arborio rice that you need instead of the singular over-priced package you might find at your standard grocery store. King Soopers, I still love you...just not for fancy rice. And if you're buying fancy rice, you might as well by fancy Parm....not the kind in the plastic shaker. I bought some Argentinian Parm. It was delicious. Put the rice, and 4 cups of the broth in a 9x9 baking pan / casserole dish. Cover. Bake for 45 minutes. When you pull it out of the oven it should look nice and fluffy and the broth should pretty much be absorbed. Remove from the oven and add the wine, remaining 1 cup broth, cheese, butter and salt/pepper. Stir, with enthusiasm, for 2-3 minutes until creamy. Serve as a side of awesome to anything else you might be making.